I thought I'd try out a new school series - Annabel. These are much more contemporary than the school series I usually read, having been written in the 80s. Annabel's school is quite different than any I've seen portrayed in fiction from that time period, which is not surprising since this is a British series. The adults are generally rather dim and there's more emphasis on boys than in older school series, of course. 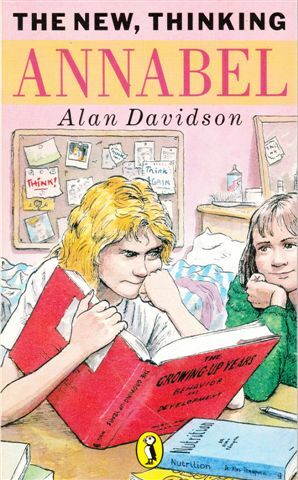 Each of these volumes contains a series of short stories about Annabel, whose fertile imagination and crazy behavior makes most people steer clear of her, except for her best friend Kate. Annabel adopts a duck, nearly drowns her friend, goes on strike against school lunches, falls in love with a singer, and more. 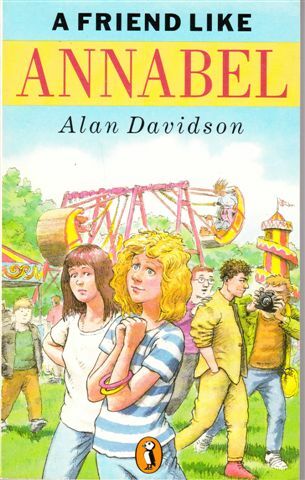 The stories are funny enough, in parts, although I see very little evidence to back up Kate and the narrator's claim that Annabel is brilliant. She thinks fast on her feet, but other than that is actually quite dumb about social situations and generally gets poor grades because she is so easily distracted. Verdict: Light, fun reads for fans of school stories, but not a series I care strongly enough about to find the rest. The edition I read of this classic from the 80s was an Avon Camelot paperback with a truly awful cover. 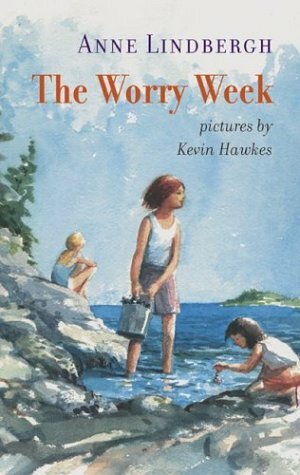 I was very pleased to see there's an edition in print now with Kevin Hawkes' lovely and timeless art. 11 year old Allegra is enjoying her family's annual vacation in their rather ancient summer house in Maine to the full, even if she does have to deal with moony older sister Alice and somewhat crazy younger sister Minnow. Then there's an emergency; an elderly relative has died and their parents must go back and arrange for the funeral. Allegra is horrified when she realizes they must give up several weeks vacation at their beloved Maine coast and stay with stuffy Aunt Ruth. But then she has an idea. At first, staying by themselves seems wonderful. But there's a lot more to being in charge than Allegra had expected. Apart from hideous 80s covers, this is a story as fresh and relevant to modern children as when it was first written. Even if you've never vacationed on the Maine coast or had a summer house, however ramshackle, every child can sympathize with wanting to be on their own as well as the frustration of having to fall in with unpleasant plans. The girls' struggles to find enough to eat and deal with various domestic catastrophes, specifically Allegra's exasperated attempts to keep her irresponsible sisters fed and (mostly) clothed, are interspersed with moments of pure magic and delight. Verdict: I was so happy to see this was still available - and in a lovely Kevin Hawkes edition. A perfect summer read for 8 - 12s. Perhaps I just wasn't in the mood for it, but I found this story extremely annoying. Mr. Green absolutely must have a nanny for his three children because he has neglected them so badly the social services are threatening to take them away. Not that he would care if they did, but it would probably destroy his "job at a law firm helping rich people avoid paying their taxes." So when Nanny Piggins shows upon the doorstep one night and says she'll only charge ten cents an hour, he hires her on the spot. There's a long tradition of eccentric nanny stories, starting with Mary Poppins and Nurse Matilda, in children's literature. There's also the animal nanny motif, although it's usually a dog like Barrie's Nana and Alexandra Day's Carl. Then there's Amelia Bedelia's brief stint as nanny, Clarice Bean's Uncle Ted, and so on. There's also the "bad nanny" sub-genre, which are generally kidnapping books. Nanny Piggins doesn't quite fit into any of these categories. First of all, as she tells the children, she has no experience as a nanny. Her real job is a porcine cannonball in a circus. She doesn't reform the children (who are quite well-behaved already) or take the place of their parents, or fit into the household in any way. In fact, she's a great deal more irresponsible than the children or their father. Her first adventure is to take the $500 for school supplies and uniforms and take the children to the amusement park, where they spend most of the money. The rest goes for chocolate and a few school supplies. She makes their uniforms with cheap dye and crayons and when they disintegrate at school she blackmails the principal into giving them another $500....which they set off to spend again. The story is, of course, supposed to be amusing nonsense, outrageous and ridiculous. However, I found it irritating, especially accompanied by the condescending warning notes about not following Nanny Piggins' lifestyle yourself and the screeds on school, uniforms, parents, lawyers, etc. I was only able to see rough sketches of Dan Santat's illustrations, since this was an ARC, but they are the only really attractive part of this book. I especially enjoyed Nanny Piggins vintage outfits. Verdict: Some kids will find the humor amusing, but the episodic adventures, universally unpleasant adults, glorification of childish irresponsibility, and patronizing narrative tone will probably annoy other readers besides myself. Today I'm looking at three middle grade adaptations of Sy Montgomery's adult works. Sy Montomery is one of my favorite Scientists in the Field series writers, so I thought I'd check out some of her other books. I tried to make it through her adult books, but just wasn't interested in that amount of philosophy mixed into animal stories. So, I took a look at three adaptations of adult books. 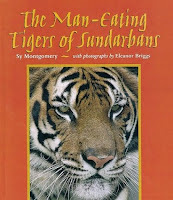 The Man-Eating Tigers of Sundarbans tells the story of tigers who are unlike any other species. They have adapted to live in an estuarine environment and have developed many unusual behaviors, including an unusually high rate of attacking and eating people. 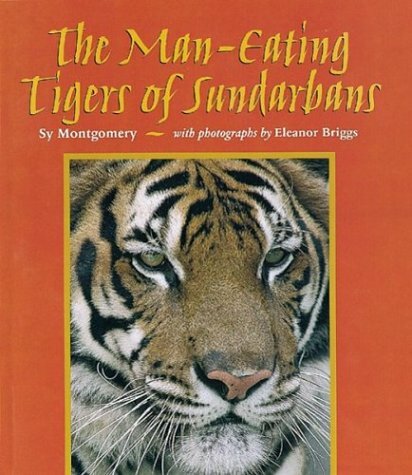 The book includes comparisons and explanations of normal tiger behavior, hypothesis on how these tigers developed their odd behaviors, and interviews with local inhabitants, including tiger lore and myth in the area. It was interesting, but there was too much speculation and not enough facts. Eleanor Briggs' photography was detailed and varied but this book was still very text-heavy. Encantado: Pink Dolphins of the Amazon is written in a very odd tense, which I can't remember the name of right now. For example "You're about to meet one of the most mysterious dolphins in the world. Scientists are eager to find out more about them. They could use your help. but studying them can be extremely difficult - as you'll soon find out." The facts and stories about these strange creatures were interesting, but the style drove me nuts. There's also lots of miscellaneous information about the Amazon and doing research and living there thrown in as well. Dianne Taylor-Snow's photography is ok, but nothing special. Search for the Golden Moon Bear follows the Scientist in the Field model much more closely. A group of scientists and interested people go on an expedition and do research to solve a specific question: Do golden moon bears exist and are they a separate species? Along the way they encounter the different culture of Cambodia, lots of bears, unexpected setbacks and help, and many bears. Returning to the United States, the bear samples are sent to labs and there's a detailed and lengthy discussion of DNA and how testing works. The DNA testing shows some surprising results - not what they'd hoped, but something unexpected and interesting. This one was like a very long Scientist in the Field and there weren't quite as many photographs, all of which were taken unofficially by members of the expedition. Verdict: The bears were my favorite, the tigers a close second. 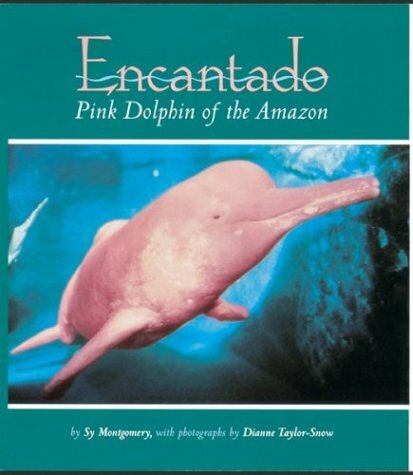 I really couldn't stand the weird tense in Encantado. If you need some longer naturalist/animal/science books for middle grade these would be good. Most of my animal lovers are much younger though and so I will stick with Scientist in the Field. I will tell you right away that this is not going to be a favorable review. So you can skip it if you don't like negative reviews. These four books are samples of Sterling Publishing's new series, Helping Hand Books which "explore a variety of experiences that children encounter as they grow up. Each gentle and helpful story is designed to be read together with your child and includes helpful parenting tips written by a leading child psychologist. These books will give you and your young ones a helping hand while you guide them confidently and sympathetically through life's events." So. 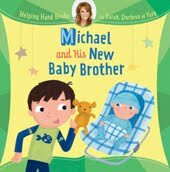 In the first story, Michael and His New Baby Brother, Michael is excited and a little worried about having a new sibling. His parents, confidently and sympathetically of course, introduce him to the idea of a new sibling by including him whenever possible, making sure he gets plenty of attention, and having him and his new brother exchange presents. As in most "issue picture books" the text is lengthy. The story is distinguished from similar picture books by its saccharine dialogue and ridiculously tidy and happy family. The "leading psychologist" advice at the end of the story solemnly warns parents to make sure your little darling continues to feel him or herself the center of attention and never, ever damage their tender little egos. Ignore this sentimental and unrealistic story and pick up one of the many excellent stories on new siblings - from the classic Martha Alexander titles (When the new baby comes I'm moving out; Nobody asked me if I wanted a baby sister) to new titles by Kathi Appelt or Kate Feiffer. 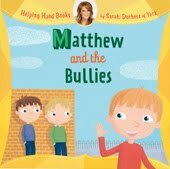 I think there's definitely room for more picture books dealing with bullying issues, but I'm not so desperate that I'd take this Matthew and the Bullies. A variety of reasons are given why Matthew doesn't want to tell anyone he's being bullied - he thinks it's his fault, he doesn't want to get into trouble, he thinks he should solve his problems. However, he has no problem telling everything to a girl in his class and readily admits he's been crying about it. Although earlier he "knew it would only make things worse" to fight back, when he finally tells his parents, he wants to solve the problem by fighting. His teacher talks to the bullies, he does a show and tell presentation displaying all his athletic medals, and voila he has two new friends. Definitely don't show this to any child being bullied. The simplistic and unrealistic solution isn't going to help anyone. Hand them some of Trudy Ludwig's books, such as Just Kidding! or My Secret Bully or a more abstract tale like Otoshi's One or Rosen's I'm Number One. 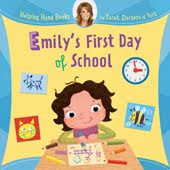 The plot and dialogue of Emily's First Day of School is so trite and cliched I'm not even going to describe it. I'll just say that with the plethora of excellent first day of school stories, there's certainly no need for this volume. Check out Antoinette Portis' Kindergarten Diary for a gorgeous new look at this scary and exciting moment in a child's life, or the more humorous Jake Starts School by Michael Wright. For children who have worries, try any of Rosemary Wells' Hilltop School stories or the sweet and gentle Miss Bindergarten series. Melanie Watt's Augustine is a good choice for going to a new school after moving, and The Apple Doll by Kleven is a comforting read for a child who doesn't feel ready to leave home. Ashley learns about Strangers is the weirdest of the four books. Ashley wanders away from her mom and gets lost. She remembers parental directions and goes to a man in a uniform for help. Reunited with her worried mother, they return home where her parents....give her a lecture on safety with strangers. Huh? This involves a blah rhyme which Ashley proudly inflicts on her fellow students at school, who indicate strong possibilities of brainwashing by cheerfully joining in with Ashley's little rhyme. The advice given by child psychologist Dr. Richard Woolfson at the back of each book is bland and generic, with plenty of instructions on boosting your child's self-esteem - i.e. making sure that nothing damages your little darling's ego. Ian Cunliffe's illustrations are bright, colorful, and cartoonish, but don't improve in any way the poor quality of the text. He's listed as a "popular children's illustrator" in the publicity materials, but he must be known only in the UK. One of the most irritating things about the illustrations is the depiction of a completely uniform and cheerful world. There's no dirt, no mess, and no fuss in these stories - and not a single non-white child either, unless you count one little girl in Emily's class with a very slightly darkened skin. Matthew manages to get a little dirt on his knees, but that's it. Michael's pregnant mother is all smiles and happiness and looks like she's never had a tired moment in her life (that match your experience moms?) and Emily must be attending an extremely exclusive private school, since there's only six kids in her class. There are more books planned in the series, but why bother? Verdict: Bland, stilted, and lengthy text set off by uninspired cartoonish illustrations in an all-white world where every problem has a simplistic and happy solution. Not recommended for any library - public or personal. All the animals in the barnyard, from the prize-winning cow to the purring cats, make a sound. But not the ladybug. She never says a word until the night she hears something so scary she knows it's time to speak up! 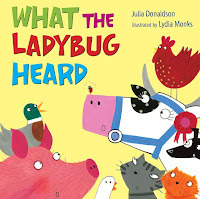 Julia Donaldson, whose Tyrannosaurus Drip and The Fish Who Cried Wolf are big favorites at storytime at our library, has done it again. This rollicking animal sounds book has a delightful plot, simple enough to engage toddlers but fun for older listeners too. The swinging rhymes are easy to chant and memorable for small listeners. Lydia Monks' bright colors and bulging eyes show off the variety of farm animals and her clever collages add in the enjoyment of identifying different mediums. I know, I said I wasn't going to look at any more picture book biographies. But...but...but....it's sooooo pretty! Told in the first person and in simple, lucid, and brilliant text, Maria Merian explains how she knows that "summer birds," butterflies, moths, and other small creatures, are not the evil things people in the 1600s thought. She describes their metamorphosis and thinks about the future, when she will write books and travel in search of even more small creatures. A historical note explains Merian's important role in medieval science, her discovery of the process of metamorphosis, and her eventual travels. Paschkis' art is amazing. Maria's determined figure dominates the illustrations, which contrast elaborate and strange medieval beliefs and mythical creatures with gorgeous butterflies and scientific observations. Each step in the process of metamorphosis is delicately illustrated in wild variety against a white background, contrasting with the black and brown backgrounds of the old medieval beliefs. 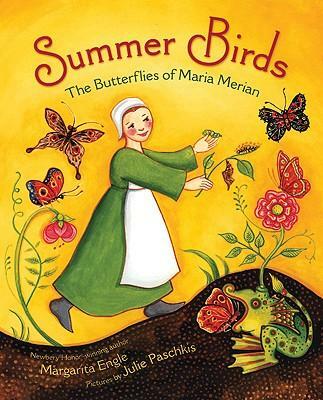 The process culminates in Maria's dream of travel and scientific study, and is full of imaginative stylings of butterflies and other small creatures. Verdict: This would make an excellent nonfiction read-aloud for kindergarten. With a little help, a beginning reader could also navigate the simple text. This old Scholastic paperback is another mixture of mystery and social/growing up issues. Yes, before you ask, I've forgotten the names of the characters in this one too and I already stuck the book in a donation box for the book sale. The boy who is the main character lives in a remote Scottish (or maybe it was Scots-Canadian?) village and is sort of unofficially adopted by the village midwife/nurse. He never feels like he quite fits in with the kids his own age, especially after they say nasty things about his unknown mother, so he starts hanging around with the older boys and getting into trouble. Meanwhile, there's a mysterious ghost in the lake, a suspicious man wanting to open a mine everyone thought was played out, and a variety of characters, both trustworthy and suspicious, to fill out the mystery cast. In the end, the mystery is resolved and the main character has the opportunity to grow and change. The sudden revelations about his parents are unrealistically dramatic and amazing, but otherwise it's a satisfying story. Verdict: Still not one of my favorites, but interesting and mildly amusing. Like most old paperback Scholastic mysteries, this combines some kind of mystery with an "issue." In this case, two boys exploring the Andes find criminal activity and a secret mine - and the main character also builds a better relationship with his father. In fact, the mystery is secondary to his growing maturity. 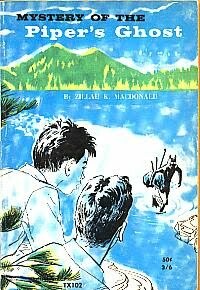 This book is definitely older - I can't picture a contemporary juvenile fiction or mystery that has one of the characters talking about it being no big deal to obey his parents and the other character's major lesson being that his own stubborness and refusal to listen are the main problems in his relationship with his father. There's also an odd view of the locals - the boys' families are both there as part of an American mining concession and modern sensibilities wince at the way they obviously consider everything theirs, not just the mine. Yes, I forgot the boys' names. Finally realized that, huh? Verdict: Mildly interesting, not my favorite of the old Scholastic mysteries. I've been looking for some more folktales to read/tell in storytime and since Margaret Read MacDonald's version of The Squeaky Door was such a HUGE hit last spring (I bought a copy for my professional collection) I thought I'd look at some of her other folktale adaptations. This is a simple adaptation of a Latin American folktale, often told as a folksong. Various family members give a small boy a pet - the pets in turn have babies and the count mounts up until he ends up with sixteen pets, all dancing together. 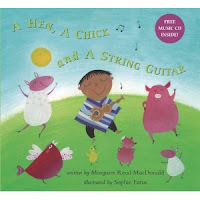 This story is probably best told as a song, and a cd is included, but I found the tune difficult to stick in my head. It's also probably best with a guitar, which I don't play. It doesn't help that a man is singing the song, so I have to try to pick up the tune and move it to my voice range. Verdict: The refrain of "Ay! Ay! Ay!" may sound funny read aloud, but I think this will work well as an interactive story, having the kids counting and naming all the animals. Another Margaret Read MacDonald I'm going to try out! I'm familiar with the English version of this story, which is a cumulative tale of an old woman trying to get her pig to go over a stile so she can get home. In MacDonald's version of a Kentucky variant, an old woman is trying to get a pig to cross a bridge so she can get home to her little boy. One of the major differences is that there's actually only a couple other animals involved and the bulk of the story is taken up by an explanation of the family situation, Old Woman's buying of the pig, and her efforts to get it across the bridge on her own. There are several refrains, "It sure was dark but the moon did shine" and Old Woman's little song. Verdict: I prefer the older English version, but this could be a good storytime title as well. I was asked by a patron for picture books on swimming - she's getting ready to teach her four year old to swim and was looking for "how to swim" books. Hmm. 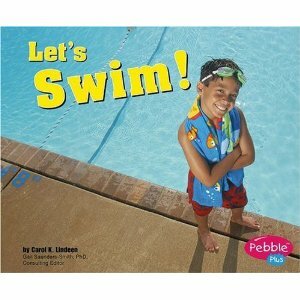 It turned out to be really hard to find how to swim books for very young children. There are quite a few (really, really bad - seriously you don't want to know) on water safety, but on actual swimming? This is what I came up with trolling through other library's catalogs. Let's Swim! by Carol Lindeen is a pretty pathetic picturebook. There are only 24 pages, including back matter. A table of contents, glossary, further reading, and index for basically 20 pages of text seems a bit ridiculous. The text features such gems as "Swimmers jump and dive into deep water. Then they swim back to the edge." opposite stock photographs. The text would make a decent easy reader and the photography isn't bad, but it's certainly not worth a $24 library bound edition, which is the only format it's available in. I know authors have to write these things to a set of guidelines, but the guidelines for this just aren't what I'm looking for. 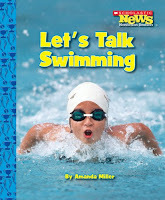 The next title, Let's Talk Swimming by Amanda Miller is actually intended to be an easy reader. 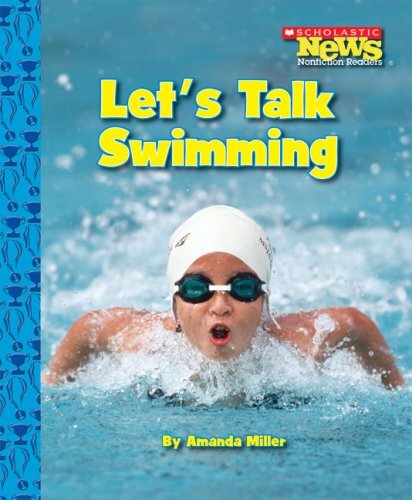 Set in the context of a race, this book talks about different strokes, practicing kicking, swimwear, and gives instructions on how to do a flip turn. This would make a good easy reader and probably a fine introduction for a small child, but I don't generally shell out $20 for an easy reader. Swimming in Action by John Crossingham and Niki Walker is the most detailed of these three books and one that I think might actually work. It opens with a brief history of swimming, some water safety, and a guide to a typical pool. It lists equipment, and how to get started with breathing instructions, stretching, and treading water. It gives instructions for various simple strokes and touches on racing and pool games. There is also a brief glossary and index. This isn't quite what my patron wanted; she was looking for something aimed at a much younger child, but the clear illustrations and photographs should give a little one an idea of what they'll be doing in the pool and a parent can easily adapt the text for a younger listener. This will also be a good introduction for older readers, so I'll be covering a variety of audiences at only $13, which is quite reasonable. Do you have any favorite swimming picturebooks? Alternate suggestions? I'd be glad to hear if you have anything better than these options. I was very excited to find a Kate Duke guinea pig story I haven't seen yet! Her concept books involving guinea pigs, such as Twenty is Too Many and Guinea Pig ABC, are favorites of mine. This book has a rather odd concept, but it's very well-expressed as a whole. Three situations are presented; a messy house, wanting to bake a cake, and a guinea pig wanting "to be like somebody else". In the first situation, a variety of options are presented, along with the (humorous) consequences of each. In the second, the author walks the guinea pigs through the steps of baking a cake - and dealing with the resultant disaster. Finally, the little guinea pig, after a variety of mishaps trying to be something she isn't, decides it's best after all to be a guinea pig! Despite my personal dislike of the "be yourself" theme, which to me implies one can never change or grow, I love Kate Duke's fresh and silly illustrations so much that I can overlook the heavy-handed issue in the final story. The first two are very funny and work excellently at showing children how to think through situations and the various steps they need to take to resolve them. Verdict: Very cute, although not the best of the guinea pig series. Out of print, so it's kind of a moot point anyways. Chase it down for your own enjoyment! I really loved Fortune's Magic Farm. I loved the magic, the characters, the classic-yet-new plot, the quirky details. However, I don't know why, but I just can't bring myself to like any of Selfors' other books. It's very frustrating. Her latest story, Smells Like Dog, is a wacky, wild adventure involving treasure, mysterious villains, carniverous tortoises, taxidermy-aspiring sisters, and the nature of dreams and duty. It just didn't work for me. The main character, Homer Pudding, was the most realistic part of the book. He knows he's strange and odd, he knows he doesn't fit in, but he just can't let go of his obsessions and dreams, no matter how unrealistic they are. He finds himself being carried away by events and deals with them the best way he can, even when he makes what seems like an unending series of unfortunate mistakes. But the other characters...I guess the problem comes down to, just too much quirk for me. A few odd characters I can handle, but it seemed like every single person had some weird, outlandish element from Homer's sister Gwen and her obsession with taxidermy to the Snooty brothers impossible names and weird complications. There is some good plotting and nice stylistic turns, but there's just too much quirk for my tastes. But that's just me. I previously ordered this for my library, mainly because I really liked the description, and it was more or less popular when I took it around on school visits. 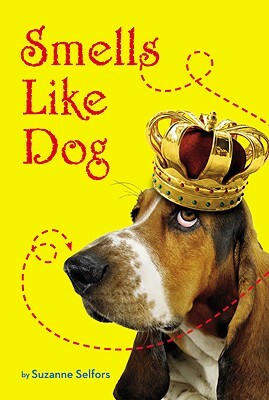 The cover is eye-popping and kids really seem to like the unending series of quirky elements and the dog aspect. I was worried that it's too long for the sometimes childish silliness, but that doesn't seem to bother my readers. Source: ARC received from Little & Brown, publication May 2010. Verdict: Although I didn't personally like this, my library patrons do and I'm glad I purchased it. Hand this one to fans of Selfors' previous books, Roald Dahl readers, and possibly Lemony Snicket fans as well. Programs immediately after holidays are HARD. Our summer storywagons don't come the Tuesday after July 4th, which leaves a gap. The first summer, I did a program by myself. We will draw a veil over that program, although I did have about 50 people come. Last year, I had a henna program. We only had 15 people, but that was about as many as I'd expected. This year, our local clogging group, The Walworth County Cloggers, volunteered their time to come and do a demonstration and teach some basic steps. Unfortunately, we had more cloggers than audience. In fact, all but two of the audience was families of the cloggers who had ferried them over. Argh! This might have been worse because we were closed on Monday. We had HUGE storytimes Tuesday morning, and then nothing until around 3 (right after the cloggers were here of course). How do you handle after-holiday down days at your library? 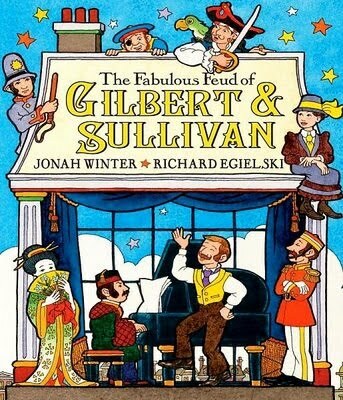 This picturebook biography of Gilbert and Sullivan focuses on the events leading up to the creation of the Mikado. It shows the very different characters of the two men as well as filling in the background of historical London. Winter also adds in information on how the two men composed and created their operas and the reception of Mikado. An author's note explains a little more about the two men, their operas, and the popularity they continue to enjoy today. One website, The Gilbert and Sullivan Archive, is listed as a resource. Egielski's illustrations give the book a verve and life with his toylike art and stylized backgrounds. A close observer can follow several characters through the pictures as they take on different roles. Verdict: Pretty, but I've sworn to buy no more picture book biographies for my library. They don't circulate and do nothing to improve my wretched biography collection, since the only patrons who want biographies are kids writing reports and they all have to be 100 pages at least. A hungry little fox decides he's clever enough to quit school and start catching chickens...how about a chicken fricasee? But, too bad, the chickens all have colds! He will have to wait until they're better...will the fox ever get his chicken? Or will the hunter get him? The plot of this story is somewhat disjointed, but apparently it's based on a Swiss fable, so there may be some cultural things I'm missing. But it's still a rather funny little tale. What I really loved about it was the gorgeously swashy greens and blues in the illustrations. The chickens are delightfully plump and innocent and the fox is gorgeously swirly and naive. The running gag of the chicken with whitewash adds a humorous note. Verdict: Gorgeous illustrations but a rather confusing story.